Have the King Himself in your home with this magnificent bust. Appearing as he did at his world-famous Aloha From Hawaii By Satellite concert, Elvis looks straight ahead, the collar of his white jumpsuit rising up to cover his neck. His shoulders taper down to the bottom of the bust, where it’s held up by a cylinder studded with stars, the name “ELVIS” emblazoned at the front. 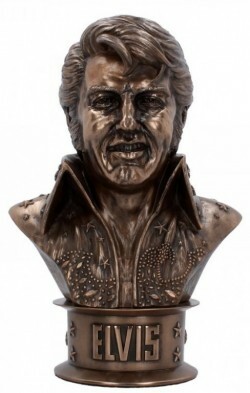 Cast in the finest resin and given a bronze finish, this fantastic bust makes the perfect gift for any Elvis fan, young or old.